The three year interim between my M.S. and Ph.D. programs was spent working as a pulp and paper industry consultant. I traveled around the U.S. performing in-stream fish, invertebrate, and water quality surveys (i.e., biological assessments) and running bioassay experiments. This was a great opportunity to learn about the natural history of some new regions, like the Pascagoula River, Mississippi. I was also able to take my first close look at the complex interplay of science, environmental law and environmental regulation. When I returned to school for my Ph.D., I wanted to incorporate environmental law in my research. And the NSF IGERT program at the University of Alabama made it possible. I studied the major environmental statutes - the Endangered Species Act, Clean Water Act, Clean Air Act, and National Environmental Policy Act - at the UA Law School with William Andreen, an internationally recognized scholar in environmental law. These laws all share two common threads. First, they are proactive: they aim to prevent harm to imperiled species or the environment before it occurs. Second, they mandate the use of the "best available science" in decision-making processes. This latter point is prone to cause problems when the best science standard is conflated with the conservative null-hypothesis testing mechanism that characterizes most peer-reviewed research. In a traditional null-hypothesis test, one begins with the assumption that "no effect" or "no harm" has occurred (the null hypothesis). Data is then collected to disprove this assumption and show that an effect or harm has, in fact, occurred (the alternative hypothesis). Barring strong evidence to support the alternative, scientists are trained to defer to the null hypothesis. This convention is logically equivalent to the "innocent until proven guilty" maxim of criminal law. However, it places the burden of proof to show that harm has occurred (which is often a very difficult and expensive undertaking) on environmental regulators and is therefore incompatible with the precautionary intent of environmental laws. This point was the thesis of a law review article that I published at the conclusion of my Law School studies. 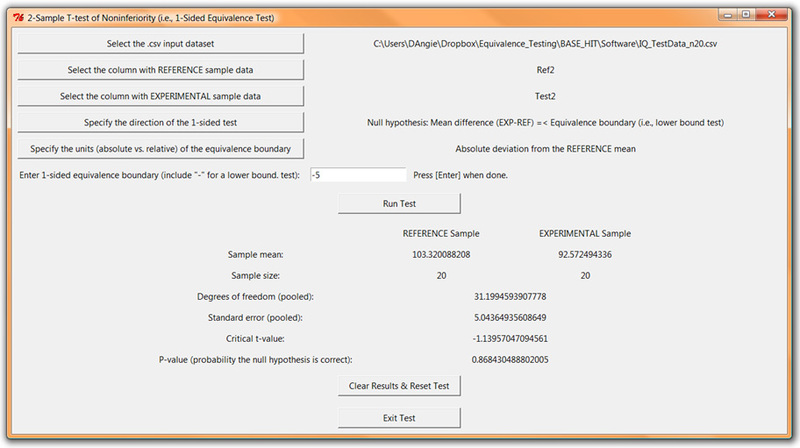 Equivalence tests are the appropriate statistical inference tools to use in environmental decision-making. They reverse the burden of proof by starting with the null assumption that a specific effect has occurred, then require the researcher to collect data to disprove this hypothesis. I previously showed how equivalence tests could be applied in an endangered species context, emphasizing that they can fundamentally alter the outcome of a scientific review. And I am now looking to get this point across to a much larger audience of scientists, environmental regulators, and legal professionals. In the rare moments between other work and family, I have been building an online toolkit to perform equivalence tests. I've dubbed it BASE HIT: Best Available Science through Equivalence-based Hypothesis and Inference Testing. A screen capture from the beta-version of BASE HIT is shown below. I'm writing the program in the R statistical programming language, but am using a graphical-user interface because I want the tool to be as intuitive and user-friendly as possible. As soon as a critical mass of functionality has been built into the tool and I'm satisfied with its stability and flexibility, I'll publish it. And once I secure some funding, I'll launch a related outreach and education program to demonstrate BASE HIT and show environmental professionals why equivalence testing should be the default decision-making mechanism in natural resource management.